I know some people don't believe me when I say I only make Rachael Ray's recipes, but I swear these are my real menu plans and they are usually 100 percent RR. Every once in awhile I'll have some random stuff to use up so I'll go outside my comfort zone. But it doesn't happen very often. There are just so many Rachael Ray recipes out there to try that I can't stop making them! Gracias for sharing your menu plans. I also love RR recipes. They are so simple and delicious. 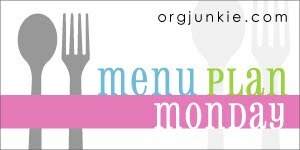 Any advice on how to create a menu plan? ?